The Minetta Tavern was WAY too dark for photos, but this burger deserves a review, nonetheless. The volume at the Minetta Tavern was generally oppressive, and Strawberry Shortcake and I had the misfortune of being wedged in beside a trio of half-stoned, three quarters drunk, and 100% loud women that appeared to be having a shouting contest--fully obnoxious. Strawberry Shortcake and I ordered both the standard Minetta Tavern Burger at $16 and the Black Label Burger at $26. 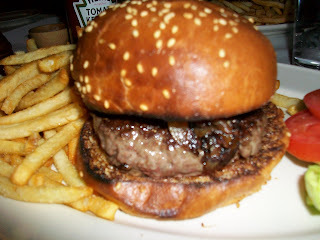 Why the Minetta Tavern Burger is even on the menu was well beyond me after we sampled them side by side. 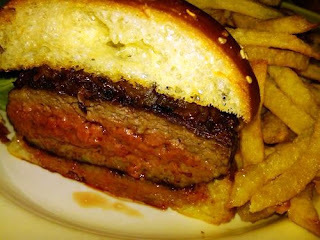 The Minetta Burger Beef: A blend of short rib, brisket, and shoulder clod, which was loosely packed into a thick patty. An OK 3 Bites (3.5 Bites) burger--it was pretty good, but certainly nothing to crow about. It was clearly heavy on the shoulder cut, so the flavors were not outstanding. $16 is a high price to pay for a pretty good burger. The Black Label Burger Beef: A blend of dry aged rib eye, which was loosely packed into a thick patty. This was outstanding. It was not particularly complex, because it was a simple blend, but it was a simple blend of really delicious Pat La Frieda beef. This produced a 5 Bites burger. The Seasoning: Yep...both burgers were nicely and thoroughly seasoned to enhance the beef flavors. The Sear: Hell yeah! The sear was fantastically thick and dark. It was created on a hot griddle using grape seed oil, which has a very high smoke point. The sear and the cooked layer penetrated about 1/4 inch into the burger patty, which provided chewiness and lushness in the same bite. The Preparation: While the Black Label Burger came out a precise Med-Rare, the Minetta Tavern Burger showed up at the same time but was a over-cooked to Medium. It was late 11:30 PM, and we were not willing to wait an additional 20 minutes to re-fire half of our meal, so we went with it. Honestly, this was fine, due to the shoulder meat content of the Minetta Tavern Burger. The interior of the Black Label Burger, beyond the cooked layer, was a juicy, rare, medium coarse ground playground of dry aged, rib eye steak. Each bite of this burger was lingered over and savored. Cheese: Cheddar, and we shouldn't have bothered with the sharp and funky Cheddar on the Black Label Burger--it was completely superfluous--it was overwhelmed by the funk of the Pat La Frieda beef. It was useful in rounding out the flavors of the Minetta Tavern Burger, however. The Bun: In both cases this was a very mild, toasted, seeded brioche from Balthazar. The bun was airy but not spongy. It served as a muted and neutral delivery vehicle. The Meat to Bun Ratio: This was completely perfect in the case of the Black Label Burger, but due to the dryness of the Minetta Tavern Burger, a smaller, moister, standard bun would have been more appropriate. The Fries: These were perfectly seasoned, and nicely crisped. The fries held to the quality of the burger. The Value: Meh. It was a great burger--it was also a $26 burger, and the quarters were cramped and loud. 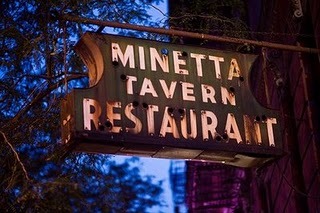 Side Note: The pickles at the Minetta Tavern were brutally acidic and heartburn inducing. They served gherkins with the Minetta Tavern Burger and a dill spear with the Black Label Burger. In both cases, it was as if the cucumbers were marinated in a blend of half cider vinegar and half battery acid. These could be safely avoided as they would be certain to overwhelm even the powerful flavors of the Black Label Burger. Until I tried the cheeseburger, two night later, at The Brindle Room, I would have sworn that the Black Label Burger at the Minetta Tavern was the best burger in Manhattan. The Black Label Burger is now my second choice for burgers in New York. It was an amazing burger with a remarkable sear, and it was prepared with great care and skill. It needed no cheese or condiments--it was perfect standing alone. On the plus side, the Minetta Tavern serves burgers every day and night, while The Brindle Room serves them on a very limited schedule. Burger Review : Have the Black Label Burger--it was truly excellent! 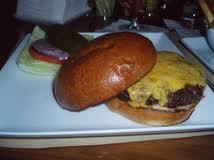 You can safely pass on the Minetta Tavern Burger...the Black Label Burger renders it meaningless. Wow, that cross section looks downright DISGUSTING. I thought only amateurs salted their beef so early that it took on the texture of a breakfast sausage. Bah...it was very tasty and juicy. The texture really wasn't like breakfast sausage. It's the temp range of the griddle that produced the steep gradient that you are seeing. It went from crisp to juicy to raw, and that was just fine. $26 was a little too much for a burger, but it was a fine burger. Thanks for the clarification, maybe it's just the lighting of the pic that's hiding the grain of the meat. $26 is pretty steep, but this seems to be the burger to get if you're on the east coast. The Minetta Tavern makes a damn good burger, but The Brindle Room makes one that is just a little better, and it comes in at 1/2 the price. You have to call ahead to make sure that they have it, but it was simply fantastic!